Book Review: "I Call Him 'Mr. 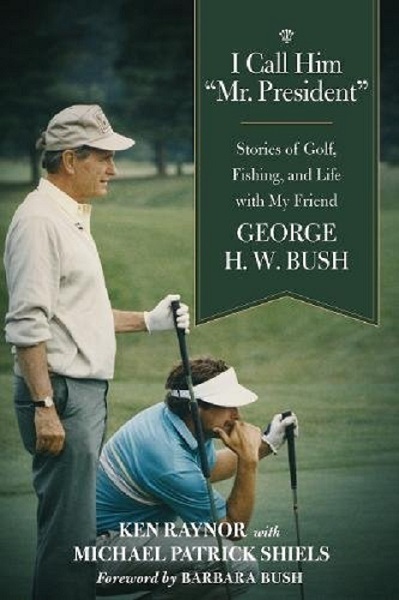 President' - Stories Of Golf, Fishing And Life With George HW Bush"
There have been many books written about former presidents of the United States, and the most recent release is worth attention. “I Call Him Mr. President – Stories of Golf, Fishing, and Life with My Friend George H. W. Bush,” was written by Ken Raynor along with Michael Patrick Shiels. Raynor reflects on the life lessons he gained from a friendship that spanned decades, and also included many outdoor adventures like golf and fishing. A few of the highlights range from Maine to Augusta National to the White House putting green, international fishing trips, retreats at Camp David, flying in Marine One, and many other unforgettable experiences. Ken Raynor, who served as the head professional at Cape Arundel Golf Club in Kennebunkport, Maine for 38 years, befriended the 41st president of the United States during Bush’s annual summer visit to the seaside resort in Maine. Raynor was inducted into the Maine Golf Hall of Fame in 2005 and was New England PGA Professional of the Year in 2003. He assisted Bush, a WWII veteran, in welcoming world leaders, former presidents, celebrities, and PGA Tour stars to the quaint Cape Arundel Golf Club and saw the excitement in their eyes during the outings. But he most cherishes his time after the rounds, in the Bush family home on nearby Walker’s Point or in a tiny fishing boat, when the president would put his feet up, stare out at the Atlantic, and recount the days’ events. Published by Skyhorse Publishing, the 216-page “I Call Him Mr. President – Stories of Golf, Fishing, and Life with my Friend George H. W. Bush,” by Ken Raynor with Michael Patrick Shiels is available on Amazon here.